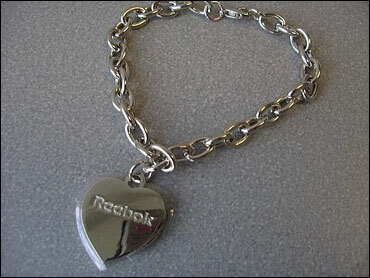 Reebok is recalling 300,000 children's charm bracelets because a 4-year-old died from lead poisoning after swallowing a piece of the jewelry, the government said Thursday. The silver-colored bracelets, bearing heart-shaped charms engraved with the "Reebok" name, were given away from May 2004 through this month with the purchase of children's shoes in major shoe stores across the country. The bracelets contain high levels of lead, the Consumer Product Safety Commission said. CPSC officials said a child from Minneapolis died after reportedly swallowing part of one of the bracelets. They did not release the child's name. "I want to assure all of our consumers and our retailers that I will do everything in my power to ensure that no other family, no other child, suffers a similar tragedy," Paul Harrington, president and CEO of Canton, Mass.-based Reebok International Ltd., said in a statement. Harrington said in a phone interview that the bracelets were manufactured in China by a contractor. He said Reebok was investigating how the bracelets reached the market despite the lead risk. "I'm conducting a full review of our procedures," he said. Reebok learned of the child's death on March 10 from Minnesota health authorities, and Reebok sales employees began notifying retailers three days later to stop distributing the bracelets, Harrington said. The family of the child who died hasn't contacted Reebok about any possible litigation, he said. In a separate action Thursday, the CPSC said about 580,000 necklace and ring sets, imported by Dollar Tree Distribution Inc., are being recalled for a lead poisoning danger. The silver-colored, adjustable rings come in a variety of designs with a toy "gem" in the center. The necklaces have a black string with silver-colored clasps and a silver-colored charm with a "gem" in the center. The packages are printed with "Mood Necklace," Mood Ring," "Glow in the Dark Necklace," "Glow in the Dark Ring," "UV Necklace" or "UV Ring." The "UV" jewelry packaging reads, "The Sun's Energy Will Change The Color." Printed on the back of the packaging is "SKU#815485" and the name "Mannix." The jewelry was sold at Dollar Tree, Dollar Bills, Dollar Express, Greenbacks, Only $1 and Super Dollar Tree stores nationwide from September 2003 through February 2006. Consumers owning either the Reebok or Dollar Tree jewelry should take it from children immediately, the CPSC said. For more information, call CPSC at 800-638-2772, Reebok at 800-994-6260, or Dollar Tree at 800-876-8077.